Popular educational toy company, VTech, has been around for a while. In fact, I had a few VTech toys when I was a child. Now, my children also enjoy VTech toys! VTech has not specialized in ‘app-compatible’ toys in the past in the same way that Fisher-Price and other toy companies have, but now VTech is releasing one of its very first toys that can be used with an iPhone. 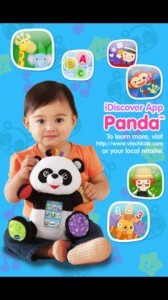 The ‘VTech iDiscover Panda Learning App Pack’ is basically a plush, panda-shaped case for the iPhone or iPod touch. Although we have seen quite a few app compatible toys that surpass this one in the creativity department, it is exceptionally cute and would be perfect for the toddler/preschool crowd. During participation in the app, children can choose to watch the activity by way of an educational video or actually participate in the video themselves. There is also an additional ‘avatar’ feature that allows parents to help the child create an avatar of themselves. After the avatar has been created, it can be used to include your child in several different videos and photos. These are considered ‘bonus items’ and can only be unlocked by creating an avatar of your child. The iDiscover Panda Learning App Pack claims to be drop (and drool!) proof and will take a beating from even the most rambunctious baby, toddler or preschooler. While the apps can be downloaded for free from the app store, with or without the panda case, it is likely that kids will enjoy them more if their game is encased in an adorable plush bear!